“You don’t think winning eight national championships and raising a son is enough? You think there’s something more you’re supposed to be doing? Pat Summitt, head coach of the University of Tennessee women’s basketball program, said those words on February 23, 2011, just months before her diagnosis of early-onset dementia, Alzheimer’s type. Summitt’s just published memoir, Sum It Up, tells the story of how a country girl from Henrietta, Tennessee, blazed a trail for women in sports by becoming the head coach of the Tennessee Lady Vols at the age of twenty-two. 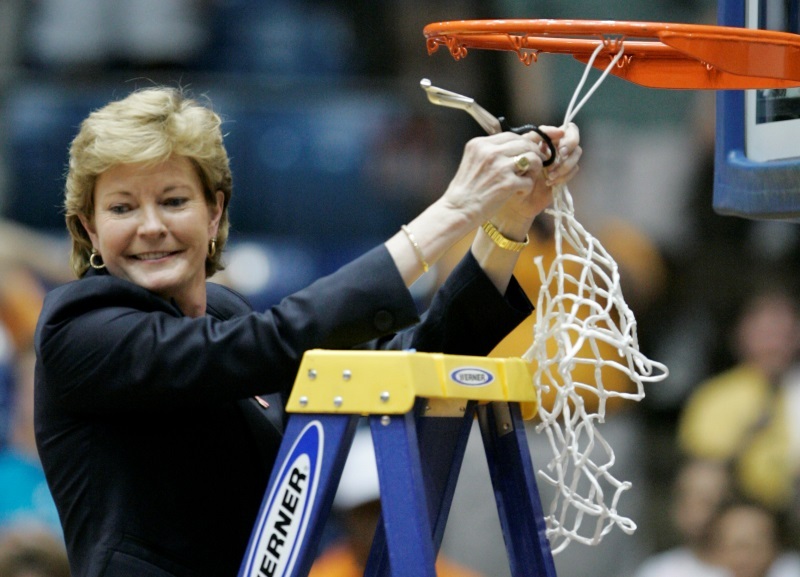 For over four decades Summitt led her teams to more victories than any man or woman in NCAA Division 1 history. Even more remarkable, every one of the 161 players over 38 years who completed their NCAA eligibility under Summitt received their degree from the University of Tennessee. The Lady Vols became the most elite and iconic basketball program in the country because of Pat Summitt’s intensely competitive spirit, love for her players, and determination to draw the very best out of those she coached. Yet the trail Pat Summitt is blazing now is very different. It’s that “something else” God wants her to do. At the height of her professional career, Summitt’s life changed at age 59. After the Alzheimer’s diagnosis Summitt remained as the head coach of the Lady Vols for one more year before deciding to retire in 2012 as head coach emeritus. Pat and her young adult son Tyler have formed the Pat Summitt Foundation, whose mission is to promote education, awareness, prevention, and support services for people with Alzheimer’s and their families. “The right of every American to first-class citizenship is the most important issue of our time.” “The way I figured it, I was even with baseball and baseball with me. The game had done much for me, and I had done much for it.” (Jackie Robinson) The recently released movie 42 is the story of Jackie Robinson, who also blazed a trail by becoming the first African American to play Major League Baseball. Robinson’s number 42 is the only one ever retired by the major leagues. 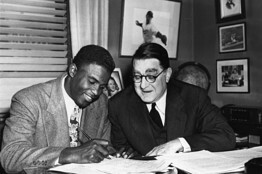 Branch Rickey was also impressed by Robinson’s character, knowing it wouldn’t work if Jackie fought back after facing the inevitable insults, hatred, threats, and abuse. “What about if you can’t get in a hotel or restaurant? What will you do? Will you fight? It will ruin all my plans,” Rickey said. “Give me a uniform and a number. I’ll give you the guts,” said Robinson. Jackie Robinson’s “something else” blazed a trail that opened doors for Martin Luther King Jr. and many others who confronted racism with a non-violent and grace-filled response. 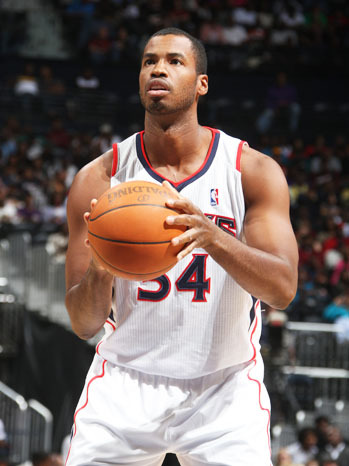 Jason Collins is blazing a new trail. While tennis player Martina Navratilova came out in 1981, and while there are many closeted gays in male professional sports, “coming out” has always remained a taboo subject. Although Collins knew he was different as a kid, he didn’t accept the fact that he was gay until he was a young adult. He didn’t even tell his twin brother Jarron until last summer. Oh, did I tell you that, like Pat Summitt and Jackie Robinson, Jason Collins is also a Christian? He writes, “My parents instilled in me Christian values. They taught Sunday school, and I enjoyed lending a hand. I take the teachings of Jesus seriously, particularly the ones that touch on tolerance and understanding…. I’m learning to embrace the puzzle that is me.” Collins received immediate support and expressions of respect and gratitude from his colleagues. How do trailblazers do it? How do human beings garner the courage and strength to do “something else,” to pave the way for others to live whole and healthy lives and make a difference in the world? There is no better model for trailblazers than the apostles who waited an upper room in Jerusalem until Pentecost. Their hearts knew there was something more that they were supposed to do than go back to fishing. When the Holy Spirit came upon them, the apostles were empowered to blaze a new trail into a hostile world, witness to the good news of Jesus Christ, and make disciples. · Trailblazers have a calling from God that spurs them on. Pat, Jackie, and Jason all relied on Jesus, the pioneer and perfecter of their faith, and the power of the Holy Spirit to guide them. · Trailblazers have the vision and willingness to travel into uncharted territory, breaking the trail for others to follow and keeping on even when the way seems unclear. · Trailblazers count the inevitable cost of leading the way by controlling their own reactions, returning evil with love, and demonstrating emotional and spiritual maturity. · Trailblazers always rise to the occasion by understanding that failure and disappointment are great learning laboratories. Our true character is revealed during the tough times. There are many things in life we cannot control, but we can always choose our attitude. · Trailblazers know that if it were not for the support, encouragement, and prayers of others working together with them, they could do nothing. What is that “something else” that God wants you to do so that you, too, can blaze a trail, pull people together, and fly? Do you feel it? This entry was posted in dsblog and tagged Branch Rickey, Christian, Jackie Robinson, Jason Collins, Jesus, Jr., Lady Vols, Martin Luther King, non-violence, Pat Summitt, path, Ralph Waldo Emerson, trailblazer, United Methodist by Bishop Laurie Haller. Bookmark the permalink. Welcome to the Detroit Conference and to the Detroit Renaissance District. Enjoyed your blog. You can add Martha Mullins to that trailblazer list. She’s the woman from Virginia who has taken Jesus’ mandate to love our enemies to find a place for the deceased Boston bombing suspect to be buried. She too just happens to be a United Methodist. Thank you, George. I read about Martha Mullins and her act of compassion and courage. I look forward to our move to the Detroit Conference. Thank you, Zola. I look forward to meeting you!